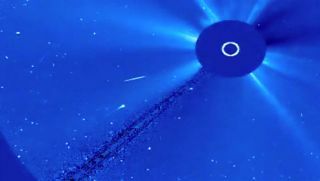 This image from a video by NASA's SOHO sun-watching spacecraft shows comet Swan (lower center left, with tail) as it approached the sun on March 13 and 14, 2012. The so-called sungrazer comet is not expected to survive its sun encounter. Just three months after one comet made a seemingly death-defying plunge through the sun, another icy wanderer is set to try its own luck in a solar rendezvous. The newly discovered comet Swan is on a collision course with our star, and it should plummet through the solar atmosphere sometime late today (March 14), researchers say. Swan's dive follows shortly after that of comet Lovejoy, which shocked astronomers by emerging from behind the sun on Dec. 15, 2011, stripped of its tail but otherwise intact. The odds are against such a happy ending for comet Swan, however. "I'm as sure as I was with Lovejoy," said Karl Battams, a solar scientist at the U.S. Naval Research Center in Washington, playfully referring to his — and pretty much every other expert's — prediction of Lovejoy's demise. "I guess my official opinion is that survival is unlikely," Battams, who runs the website Sungrazing Comets, told SPACE.com via email. Swan was discovered March 8 by comet hunters scouring images taken by the Solar and Heliospheric Observatory (SOHO) spacecraft operated by NASA and the European Space Agency. The comet takes its still-informal name from SOHO's Solar Wind Anisotropies, or SWAN, instrument. Like Lovejoy, comet Swan is what's known as a Kreutz sungrazer comet. All Kreutz sungrazers— so called because their orbits bring them close to the sun — are believed to be the remains of one giant comet that broke apart several centuries ago. They're named after the 19th century German astronomer Heinrich Kreutz, who first demonstrated that such comets are related. While comets dive into the sun on a regular basis, Lovejoy was something special, and not just for its remarkable survival. First of all, astronomers discovered the icy wanderer in late November, so they had several weeks to prepare for and document its astonishing solar close encounter. Further, Lovejoy was incredibly luminous, the brightest sungrazer ever observed by SOHO. At its peak, it blazed roughly as brightly as the planet Venus. That's a tough act for Swan to follow, and chances are the comet won't quite measure up when it takes the plunge. But even if we're about to see the last of Swan, the comet should still go out in a blaze of glory, researchers say. "I think it will be the second brightest Kreutz-group comet seen since the 1970s," Battams wrote on Sungrazing Comets Monday (March 12).